Calgary Flames captain Mark Giordano celebrates his goal with teammates on Saturday. 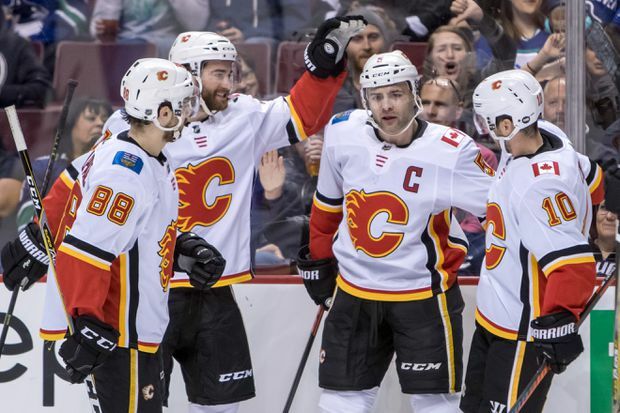 Mark Giordano’s “unbelievable” three-point performance on Saturday proves why he’s the captain of the Calgary Flames, says the team’s goalie. Giordano tallied a goal and two assists in the Flames’ decisive 3-1 win over the Vancouver Canucks. “He puts it all out there ever time he’s on the ice and he’s getting rewarded for all the hard work he puts in with points this year,” Mike Smith said. The 35-year-old defenceman now has 72 points in 73 games this year. He’s currently riding a seven-game point streak that’s seen him notch two goals and eight assists since March 10. “He deserves every accolade he’s getting, he’s one of the biggest warriors I have ever played with,” said Smith, who turned away 27-of-28 shots in the win. Giordano opened the scoring 9:44 into the first period on Saturday after Derek Ryan sliced him a pass from down low. The veteran blue liner collected the puck on his tape and fired a snap shot into the top left corner of the net over a diving Jacob Markstrom. Being in on every big play is nothing new for Giordano, said Flames coach Bill Peters. Fourth-liners Garnet Hathaway and Andrew Mangiapane also scored for the Flames (47-21-7) and Giordano was quick to give them credit. Brock Boeser scored a power-play goal for the Canucks (32-33-10), extending his point streak to nine games. “I feel confident out there. I’m moving a lot better and getting to pucks and causing turnovers,” the right-winger said. Markstrom had 28 saves for Vancouver. The defeat was deflating but there were still bright spots, said Canucks coach Travis Green. The Flames were the first team in the West to clinch a playoff spot and remain at the top of the conference standings after passing the 100-point mark on Saturday night. The last time the club posted 100-plus points was in the 2005-06 season. But there’s still work to be done before the regular season ends, Giordano said. “We’re proud but we want to keep going, keep playing well going into playoffs, try to solidify the division and go from there,” he said.